Don’t ask me to explain the details of Steven Soderbergh’s latest heist film, Logan Lucky, because I can’t—but that doesn’t mean I didn’t enjoy this Southern fried Ocean’s 7-Eleven to the fullest. I can’t take credit for the above clever 7-Eleven quip, which references the film director’s prior forays into classic heist film territory. It is a throwaway line used by the film's TV anchor reporting on the heist of the huge cash take at the Charlotte Motor Speedway in North Carolina during the running of NASCAR’s Coca-Cola 600. For anyone unfamiliar, 7-Elevens are convenience stores famous for Slurpees, ptomaine hotdogs, and being referred to in LA as Stop-n-Robs. 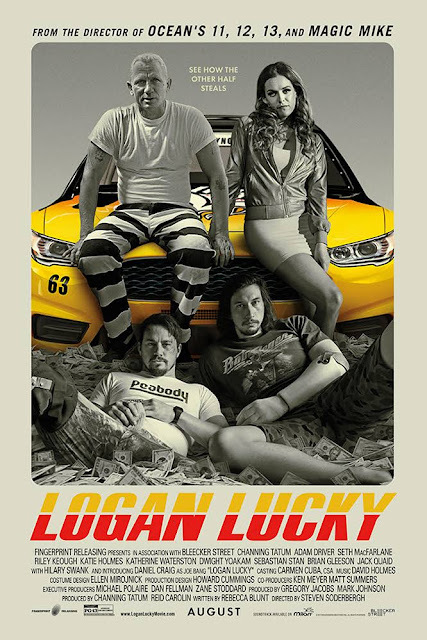 But Logan Lucky has a wide variety of far more clever ingredients and set pieces, which don't need the joke explained. I had a big smile on my face as one part of the heist after another clicked into place. Despite being a fuzzy on the details, I was caught up in whatever was to come next--and in not knowing what it was going to be. While all of this is straight by the numbers from Soderbergh’s usual bag of tricks, there is enough depth of characterization, poignancy, and charm to turn it's moonshine sensibilities into Southern Comfort. While none of this is supposed to be taken seriously, there is a serious attempt not to treat to the audience as if it had a negative tooth to tattoo ratio. 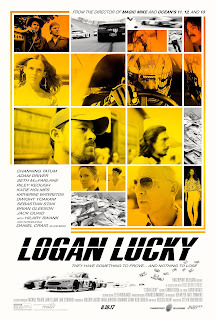 And if several secondary characters verge on inbred Southern stereotypes, Soderbergh never treats them with contempt. Instead, he handles them with a subtle sense of humor and a certain endearing affection. 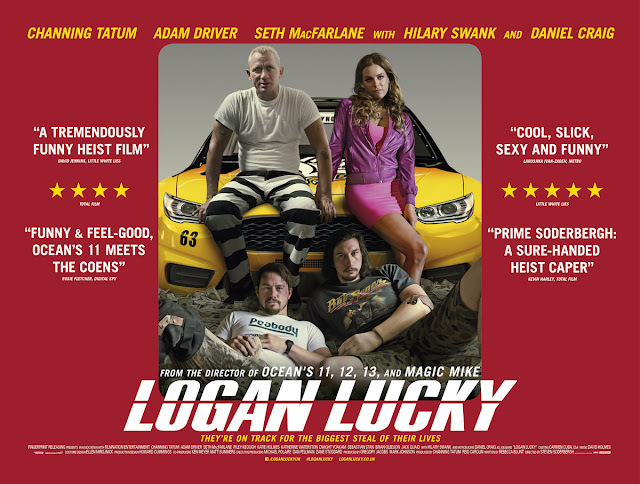 It also helps that Channing Tatum and Adam Driver never push their working class characters into parody. Driver’s prosthetic arm—the original lost in Iraq—even becomes a brilliant bit of emotional misdirection used to cover a raft of plot holes. 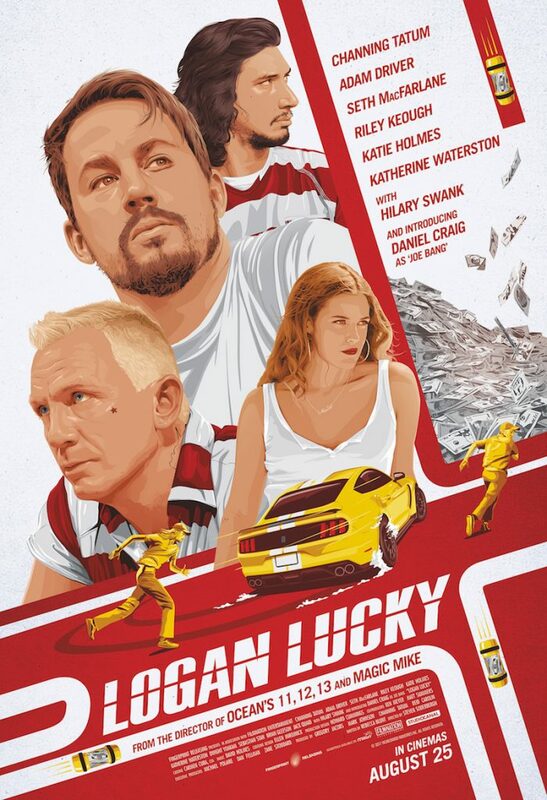 With Tatum and Driver consciously underplaying their parts, Daniel Craig—as the blond, buzz-cut, tattooed, Joe Bang—is able to let loose without fear of turning the film into an episode of The Dukes of Hazzard or the slapstick comedy of Talladega Nights. 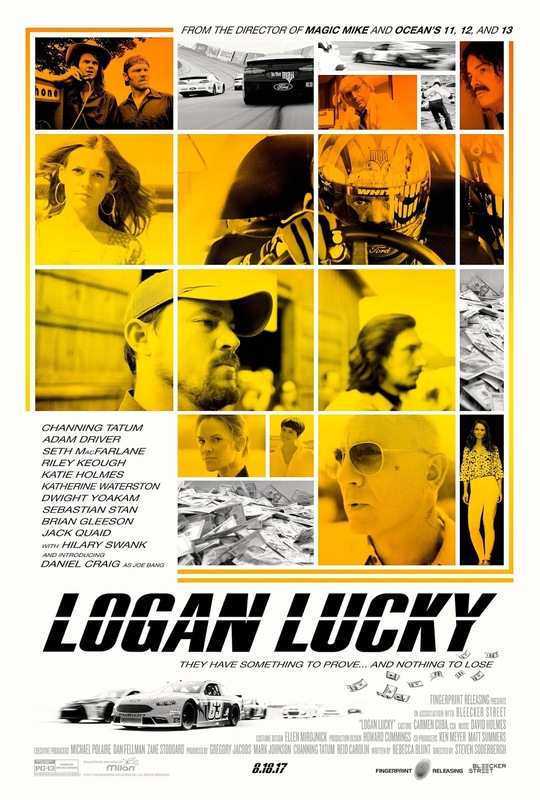 As in many of his films, Soderbergh's directorial technique purposely doesn’t allow his stars to disappear into their characters. Instead, you are acutely aware of the actors you are watching while also being aware of each Soderbergh touch as it appears on the check list. Strangely, this calculated method has the effect of somehow making the film stronger—the professional chops on the screen avoiding deterioration into scenery chewing because the script keeps everything twisting and turning. Special kudos are due to Farrah Mackenzie playing Channing Tatum’s young daughter—who tugs at your heartstrings at the perfect moment. Also to Hillary Swank, who puts in a late appearance as a tightly wound FBI agent, and gets to put the final twist in the tail. While you never get to completely suspend your disbelief, the sum of the parts is a ridiculous fun and quirky ride fueled by Moon Pies and RC Cola.